Before you can start processing your customers’ credit card payments, you require a merchant account with our gateway. 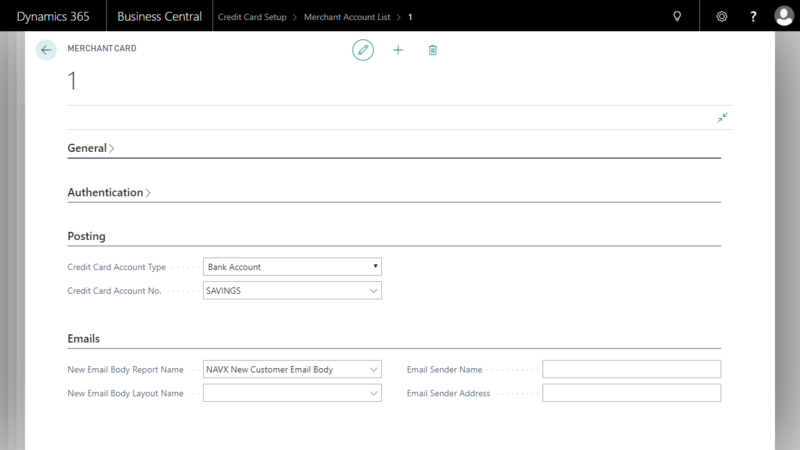 If you have a live merchant account already, you can skip ahead and either use the Assisted Setup to configure NAV-X Credit Card with the live credentials or follow the steps below to update the Credit Card Setup with this information. You can fill out the form here to initiate the merchant application process. We will contact you and work with you to gather the remaining information needed, explain the fees for you, and answer any questions you have. We will be there for you for every step in the way. If you are processing already credit card transactions with another gateway or even with another software, we can also help you understand the potential savings. 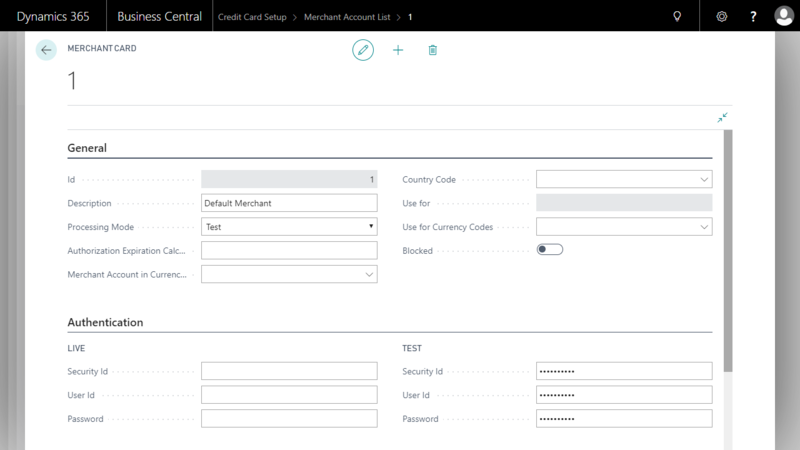 Before you can process credit card transactions, you have to sign up for a Microsoft Dynamics 365 Business Central tenant. If you have not signed up yet, you can sign up at https://trials.dynamics.com/Dynamics365/Signup/businesscentral. Once you have your solution provisioned, you can add the NAV-X Credit Card app directly from the AppSource marketplace here. If you have questions about the installation process of an app through Microsoft AppSource, you can review the Microsoft Dynamics 365 for Finance and Operations, Business Edition documentation here. You can start the merchant setup by searching for “Merchant Account” or by clicking on “Merchant Accounts” in the Credit Card Setup window. When you are on the Merchant Account List, please select “Edit” or “New”. For each merchant you can select “Test” or “Live”. It is recommended to use the test mode only in the test or “Cronus” companies and the live mode in your production environment. When the merchant is in test mode, no live credit card transactions can be processed. Different banks have different timeframes an authorization is valid for. After this time period, those authorizations expire, releasing the funds. Define the authorization period as a date formula in this field to allow the system to automatically reauthorize the authorizations before they expire. Please contact your gateway for the best value to define here. If this merchant is only valid for a specific country, please define the country code in this field. When selecting the proper merchant to use for a specific transaction or customer, the system will first select the merchant that matches the country code defined before looking for other merchants that could be valid. If you have defined a dimension in the “Merchant Dimension Code” field on the Credit Card Setup, you can define a dimension value in this field. This will allow the setup of multiple merchants used for different departments, business lines, or other dimensions. You can define multiple merchant accounts and each merchant account can be defined to be used for transactions in a different currency. This can be useful, if you have different merchant accounts to reduce the amounts of foreign exchange transaction charges. If you have received the merchant credentials from the gateway, you can enter the Security Id, User Id, and Password for your live merchant connection here. Enter the Security Id, User Id, and Password for your sandbox merchant here. You can define a credit card clearing account as a balancing account for all credit card transactions. The clearing account will be used to reconcile transactions with the actual money received from your gateway. You can select between a G/L Account and Bank Account. It is recommended to use a bank account as the credit card clearing account, since Dynamics 365 Business Central provides advanced reconciliation functionality for bank accounts, which will make it easier for you to keep track of your credit card processing. Select a G/L Account or Bank Account from the drop down list. It is recommended to use a Bank Account and create a new bank account only as a credit card clearing account. The “New Email Body” report allows the definition of the email body for emails sent to customers inviting them to sign up for the EBizCharge Connect Portal. You can use the default report provided with the software or create your own report. If you want to customize the wording of the email body for a new customer sign up for the EBizCharge Connect Portal, you can create a new layout for the specific report and update the texts. If you want to use the default body, please do not select any value in this field. Enter the name that you want to show as the sender in an email that is sent to a customer inviting them to sign up for the customer portal. Enter the email address that you want to use to send the email from to invite customers to the customer portal. This email has to be accessible from the account that is configured in the SMTP email setup. To learn for about the Email Setup click here.